"The visuals," says bassist Jasper Høiby about his band Phronesis, "are just the icing on the cake." The music is his primary concern, but it's undeniable that Høiby's Anglo-Scandinavian trio is one of the most visually striking outfits on the European scene. There's Høiby himself: tall, slim, blond and often rather intense looking, playing his double bass. Then there's Anton Eger, sartorially stylishpossibly the only drummer in contemporary music who looks good in a bow tieand constantly in motion as he makes inventive use of his entire percussion arsenal. Balancing out this dash and flair is British pianist Ivo Neame, content to leave the visual spotlight to his band mates as he focuses on his musical contribution. 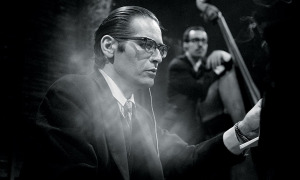 Given that the average jazz ensemble these days has a somewhat limited visual appeal, it's not surprising that Phronesis garners attention for how it looks; but Høiby's insistence that the sound is what matters is readily borne out by the music the band produces. This is some of the most creative and exciting new work to appear on either side of the Atlantic. It needs no help from visual stimuli, a perception that gained further credence in 2011 when Høiby decided to play a series of concerts in total darkness. 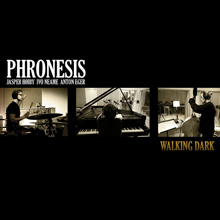 The Pitch Black concerts, inspired in part by Høiby's older sister's visual impairment, were a precursor to the band's fourth album, Walking Dark (Edition Records, 2012), which finds Phronesis at the top of its game. It's another milestone in Høiby's own development as a musician, composer and bandleaderand in Phronesis' development as a unit of international standing. Høiby began to play double bass in his native Denmark, and he moved to the U.K. to study at the Royal Academy of Music, arriving in London in 2001. 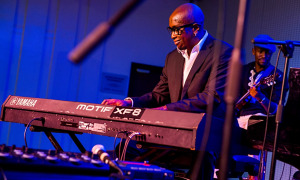 His involvement in the London scene led to membership of the Loop Collective, one of the relatively loose but inventive collaborations that grew up in the city in the early 2000s. 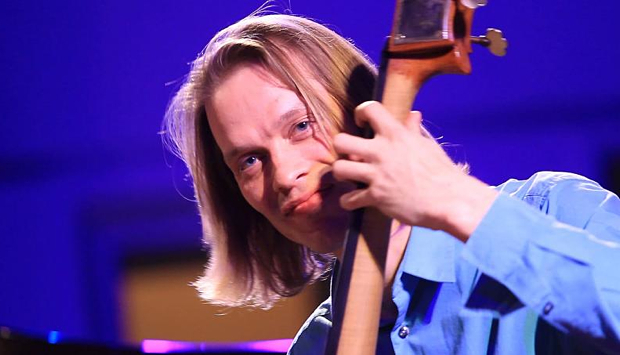 Over the next few years, Høiby established himself as a first-call bassist with performers such as vibes player Jim Hart, saxophonist Mark Lockheart and vocalist Julia Biel. As he begins to talk about his time in the U.K., he seems slightly taken aback by the realization that it's been over a decade since his move. Was it intended to be a long-term arrangement? "No," says Høiby emphatically. Then he laughs before continuing: "I wasn't thinking that far ahead. I came here to study, and that's all I was thinking about. Everything after that was kind of incomprehensible." However, things worked well for the bassist, the move became permanent, and he now considers the U.K. to be his home. Does this mean that he sees Phronesis as a British band? "I'm not sure that I see it as a British band, but definitely part of the British scene. I'm totally comfortable with that. This is where I've spent the last 11 years; my contemporaries and friends are here, so I do feel like I'm from here, too. I would never run from my Scandinavian roots, though." If Høiby only partially mapped out his move to the U.K., did he approach the establishment of Phronesis in a more organized fashion, or was it a more serendipitous event? "There was hardly any planning," he says, and pauses for a moment before asking, "Can I say that without sounding like a really lazy guy?" He continues, "I was comfortable in London. I'd stayed around after I finished studying, trying to get things going. ...Then this thing happened to my sister, and I decided to go back home to help my family out." Høiby's sister, Jeanette, lost her sight. Helping the family to deal with this gave Høiby little time for music. "When I went back to Copenhagen, I didn't really have anything to do with the music scene. But I already knew Anton and loved his playing, and eventually I took up the chance to play with him. I told him that I would be interested in working with him in a trio of some sort. I had some material, but I wasn't really too concerned about what the third instrument would be. Anton brought along Magnus Hjorth. 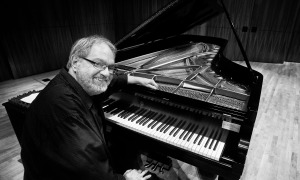 The piano is a favorite instrument of mine but I wasn't sure if my tunes would fit a piano trio." The lineup worked, the tunes and the piano fit together, "And that's how Phronesis started. We worked for a while in Denmark, then I moved back to the U.K."
Høiby formed Phronesis in 2005. Its debut album, Organic Warfare (Loop Records) appeared in 2007, featuring Magnus Hjorth on piano. Its second album, Green Delay (Loop Records, 2009), was dedicated to Høiby's sister, and featured the current lineup with Neame and Eger. 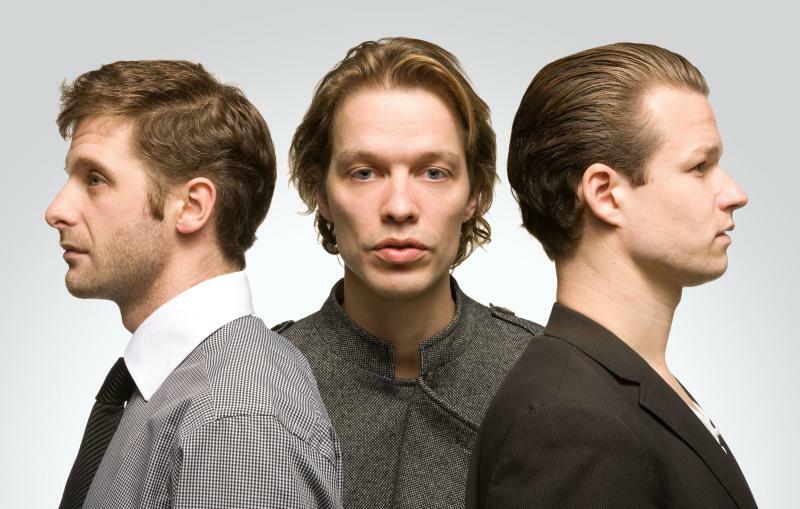 Both albums were received well by critics and fans and helped to establish Phronesis' reputation as one of Europe's best up- and-coming bands. It was Alive (Edition Records, 2010) that really broke big, gaining rave reviews and Best Album awards from Jazzwise and Mojo. The album was recorded at the Forge in Camden, London. Due to a last-minute problem, Eger was unavailable. American drummer Mark Guiliana took his place temporarily, for the concerts that formed the basis of the album, before Eger returned to the fold. 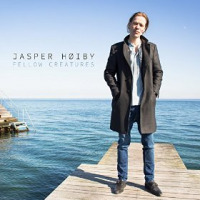 From the beginning, Høiby intended Phronesis to be a long-term project, an intention that has involved him in all the activities that leading a band entails. "I didn't put much thought into it at first; I was more focused on the music. But I was interested in getting to the point where we'd have a lot of opportunities to play the music, and to do that, you need to take care of business and do as much as you can to make it happen." Seven years after forming the band, Høiby is still full of enthusiasm, almost unaware of how long Phronesis has been around. "Wow, seven years. It's been quite some time." Høiby has referred to Phronesis as a piano trio, as have many writers and reviewers. It's a term that perhaps suggests a band where bass and drums exist to support the lead instrument, where the piano is at the forefront of the sound. If that's the case, then it's too restricted a term to describe Høiby's band, where the bass and drums are equally able, and likely, to step up and take a lead role. This degree of equality and democracy prevents Phronesis from sitting comfortably within the notion of a piano trio. "Yes, I agree. It's always been a musical ambition of mine to have this equality, not because I'm a hippieeven though I am a hippiebut because I think it's a really nice thing if everyone in a band feels that they're equally involved, and there's not necessarily those traditional notions about who gets to play most." For the first three albums, Høiby composed all of Phronesis' material. Walking Dark represents a major shift in this policy, with Neame and Eger contributing tunes. This shift illustrates Høiby's increasing confidence as a bandleader and his obvious respect for the talents of his fellow players. "I know Anton and Ivo really well and have huge respect for them as composers, so it just felt right to get them to contribute to the writing. I've been really fortunate to play with these guys for so long, so it's also about showing them some respect." Does it not lead to a subtle change in the band's dynamics? "Yeah, I think it does. We had a discussion when we first started doing this because I was keen to keep having the last word. If there was something I didn't feel totally comfortable with, I wanted to be able to say, 'I think you should do it this way.' Having said that, Ivo and Anton are happy to bring their ideas forward and suggest ways it should be played. Even with my tunes, they make suggestions for arrangements and things. But I still have the final say, basically." Before going into the studio, the band had familiarized itself with the tunes to varying degrees; some were well played-in, while others came late to the session. 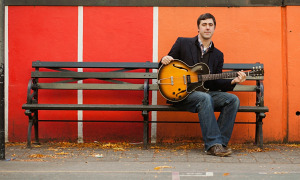 "We played most of it," Høiby explains, "but there were a few last-minute tunes we decided to include: 'The Economist' and 'Passing Clouds,' for example. I heard Ivo do a solo gig a couple of weeks before we recorded: he played a version of 'Passing Clouds' as part of a longer piece called 'Passing Point.' It's on his album [Caught In The Light Of Day (Edition Records, 2009)]. He was playing around with the tune, and I thought that it would really work with the band. We arranged it slightly differently and found a way for it to work in the trio." "The Economist" was written by Eger, and it was another late addition to the album session. "Anton brought the tune a week before recording. He said, 'Oh, it's really easy.' Then he showed us the chart. I took one look and thought, 'Oh no. This is what I'm going to be doing for the next three days.' Ivo and I really had to work on that one." Eger's approach to writing differs a little from Neame's and Høiby's, as the bassist explains. 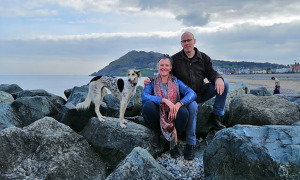 "Normally, Ivo and I leave things pretty open. Anton will often bring the complete idea of how a piece is going to be. I might look at it and make suggestions. If I think there are too many things going on, I'll suggest taking things out. I do try to simplify stuff because then it leaves space to add your own thing."